Interesting personal coments on Eucharistic exclusion as a tool of ecclesiastical diplomacy. I take Steve Hayes’ useful point about the dangers of Church Consumerism, about which I generally agree with him, but I need to say that Dr Steffensky was coming from somewhere entirely different in Bremen. Steffensky was emphatically not saying “You should have it because you want it and have a right to choose.” He was starting at the other end, with the nature of the Eucharist, as that which constitutes the Church. To have a category of Christians who are grudgingly acknowledged to be so but excluded from table fellowship is a wrong answer to St Paul’s fundamental question “Is Christ divided?” By his death and resurrection Christ has broken down every dividing wall; then we go and build a few of our own. Steffensky objected to anything that turns unity into a human and institutional achievement, rather than something Christ has made by his death and resurrection. He was trying to take fully seriously the forward-looking and sacramental meaning of Communion. A modern Club mentality was exactly the thing to which he most deeply objected. His ground conviction was that the Eucharist makes the Church, far more than the denomination defines the Eucharist, and that’s why, he would say, real liturgical terrorism is making a holy Sacrament into a weapon in the ongoing historic game of denominational cowboys and Indians — unworthy and destructive behaviour. I always wonder what horses think about a coachman. I imagine that they think him stupid, unjust, particular about unnecessary triﬂes, and always checking them needlessly. But his business is to get the coach along without upsetting it. He is on the box and he sees more than anybody else. He is not responsible for the obstacles in the road, and if he could regulate all the trafﬁc, he could make things easy all round. But alas he is limited to the obscure and ignoble duty of steering his own vehicle to the best of his power. Bishop Mandell Creighton to Henry Westall, 3 April 1900. W.Scott, “An ‘advanced’ view of the ‘Church Crisis’,” Nineteenth Century, April 1901, p 692. [Jesus] had told his friends to do this henceforward with the new meaning ‘for the anamnesis’ of Him, and they have done it always since. Was ever another command so obeyed? For century after century, spreading slowly to every continent and country and among every race on earth, this action has been done, in every conceivable human circumstance, for every conceivable human need from infancy and before it to extreme old age and after it, from the pinnacles of earthly greatness to the refuges of fugitives in caves and the dens of the earth. Men have found no better thing than this to do for kings at their crowning and for criminals going to the scaffold; for armies in triumph or for a bride and bridegroom in a little country church; for the proclamation of a dogma or for a good crop of wheat; for the wisdom of the Parliament of a mighty nation or for a sick old woman afraid to die; for a schoolboy sitting an examination or for Columbus setting out to discover America; for the famine of whole provinces or for the soul of a dead lover; in thankfulness because my father did not die of pneumonia; for a village headman much tempted to return to fetish because the yams have failed; because the Turk was at the gates of Vienna; for the repentance of Margaret; for the settlement of a strike; for a son for a barren woman; for Captain so-and-so, wounded and prisoner of war; while the lions roared in the nearby amphitheatre; on the beach at Dunkirk; while the hiss of scythes in the think June grass came faintly through the windows of the church; tremulously, by an old monk on the fiftieth anniversary of his vows; furtively, by an exiled bishop who had hewn timber all day in a prison camp near Murmansk; gorgeously, for the canonisation of S. Joan of Arc – one could fill many pages with the reasons why men have done this, and not tell a hundred part of them. And best of all, week by week and month by month, on a hundred thousand successive Sundays, faithfully, unfailingly, across all the parishes of Christendom, the pastors have done this just to make the plebs sancta Dei – the holy common people of God. Dom Gregory Dix, The Shape of the Liturgy, (London 1945), p744. I wonder how the Quakers fit in in this issue? They do not celebrate the eucharist (and don't baptize though some coming from other traditions may be baptized). The British Yearly Meeting has a leaflet but how do other churches feel about Quakers? Or going further afield, non-Christians? 'His ground conviction was that the Eucharist makes the Church, more than the denomination defines the Eucharist, and thats why, he would say, making it into a weapon in the ongoing historic game of denominational cowboys and Indians is unworthy and destructive'. That seems to make sense. Coming from the evo tradition, I can remember the 80s and a desire to 'get back to the Bible'... I can now see the importance of church tradition as well. But.... when the eucharist/mass/communion becomes closed and something that has to be excessively theologised over to justify that closedness, I'm thinking that that way of thinking is what we need. But then again, I'm weslyan so I would say that wouldn't I?! This is a comment on the last two posts - only just had time to do so. "we break this bread to share in the body of Christ. Though we are many, we are one body because we all share in the one bread"
I find myself thinking that if we wait to achive perfect unity before we can share in the eucharist we are missing the point big time. 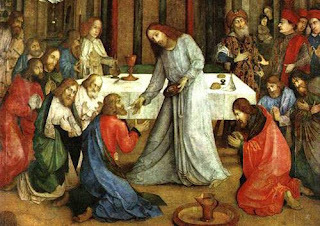 The eucharist is the ultimate reconciling sacrament. Jesus shared the Last Supper with his disciples, all of whom would betray him in different way. Not much unity there! 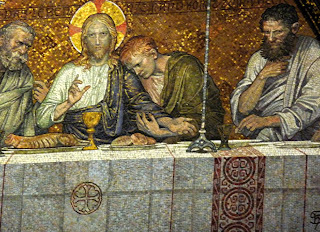 Reconciliation, forgiveness is not something we achieve, it is something that God gives us and the eucharist is the sacrament when, as we share the broken fragments we can be reconciled and united through Christ, whose body we are and whose body we are sharing. To refuse communion because of theological differences (whether inter-denominational or intra-denominational)seems to me to be one of the greatest rejections of Jesus possible - and a lack of recognition that it is only in Christ that we can be reconciled and united. That passage from Dom Gregory Dix is one of my all-time favourites - I cut it out of a parish newsletter nearly twenty years ago and have kept it ever since.